HD Fix to the blurry arcane enchanter texture. Every time I used an Arcane Enchanter I got bothered about that ugly blurry texture. The original texture is so blurred that the wood grains are almost unnoticeable making it look like a painted cardboard. 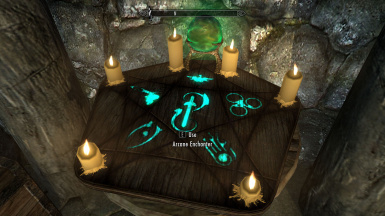 This quick mod fixes that by adding some detail in an upscaled normal map and by using a bigger diffuse texture, maintaining the original look and 'spirit' of the enchanted wood table. P.S. 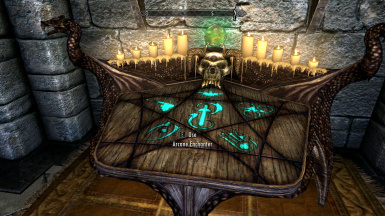 : The real problem of the model is the shoddy UV mapping, the biggest surface, the table lid, is only 256x256 inside a 512x512 texture, which is a big no no. My fix was done entirely by texture work, the blurry texture didn't bother me enough to re-map the model again to preserve the original 512x512 texture size. It's a 2048x2048 size texture now, a bit overkill for a table, but it works well.